Delightful mountain home on a gentle acre in the convenient Cragmont/Farview Acres neighborhood! 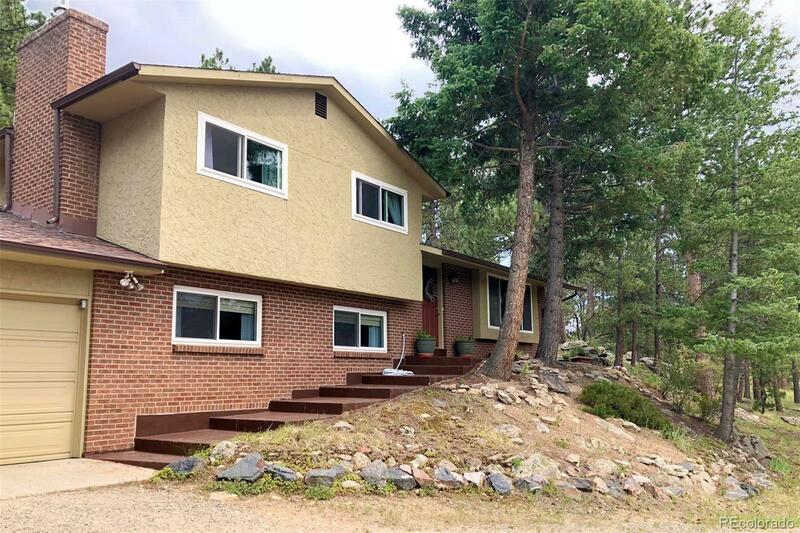 Award winning schools and less than a ten-minute drive to Conifer or downtown Evergreen. Easy commute to Denver via I-70 or N Turkey Creek/Hwy 285. Beautiful Mount Evans views will take your breath away. The main floor features an open floor plan, with a large eat-in kitchen island, dining area, half bath, and living room. Upstairs is a full bathroom and three bedrooms with ample closets and beautiful hardwood floors. On the lower level, relax in the large family room with brick fireplace. Also downstairs is a laundry area, 3/4 bathroom and an office/man-cave with tin ceiling tile. Enjoy Colorado wildlife and scenery from the private back-yard patio, and separate deck. Large attached two-car garage with additionally attached carport for extra storage or parking. RV parking along the side of the driveway with your very own home dump station too. A perfect home for the mountain adventurer.